We are having a great sale on our two most popular styles of the Aden and Anais Muslin Wraps 4 Pack. Both the Zoo and Mod styles are now only $35.99. 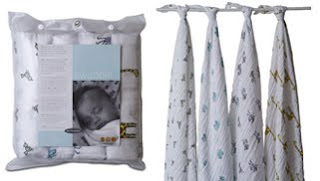 They normally retail for $44 so this is about a 20% savings on these very popular swaddling blankets. These make great baby shower gifts and both patterns are gender neutral so they will be great for both girls and boys. In case you are not familiar with the brand, Aden + Anais makes a great line of products using muslin cotton. 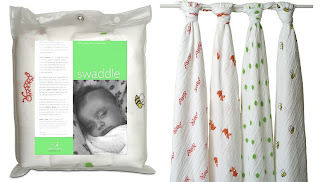 Their primary product is the swaddle blankets made out of breathable muslin. Their large size (47" x 47"), their softness and their breathability is what helps them differentiate themselves from other blankets on the market. I also use the blankets as nursing covers, burp cloths (hey, things happen!) and a clean place to put my baby down. Click here to purchase the blankets. I have liked these sets for a long time and now when I get such a big discount I will definitely take this chance to buy.